A myocyte (also known as a muscle cell or a muscle fiber) is the type of cell found in muscle tissue. Myocytes are long, tubular cells that develop from myoblasts to form muscles in a process known as myogenesis. There are various specialized forms of myocytes: cardiac, skeletal, and smooth muscle cells, with various properties. Skeletal muscle fibers are extremely long, cylindrical cells. A single muscle fiber can be up to a foot long in some muscles. This unique property is made possible, because the muscle fiber itself is actually formed from the fusion of literally hundreds of embryonic cells that get fused together during development. Since skeletal muscle cells (muscle fibers) are made from the fusion of hundreds of embryonic cells, they contain many nuclei. In other words, they are multinucleated. You will notice that the nuclei lie on the outer portion of the muscle fiber when examining skeletal tissue under the microscope. Skeletal muscle fibers have 'stripes' called striations. These striations are due to the presence of the myofibrils that make up the major portion of the muscle fiber. 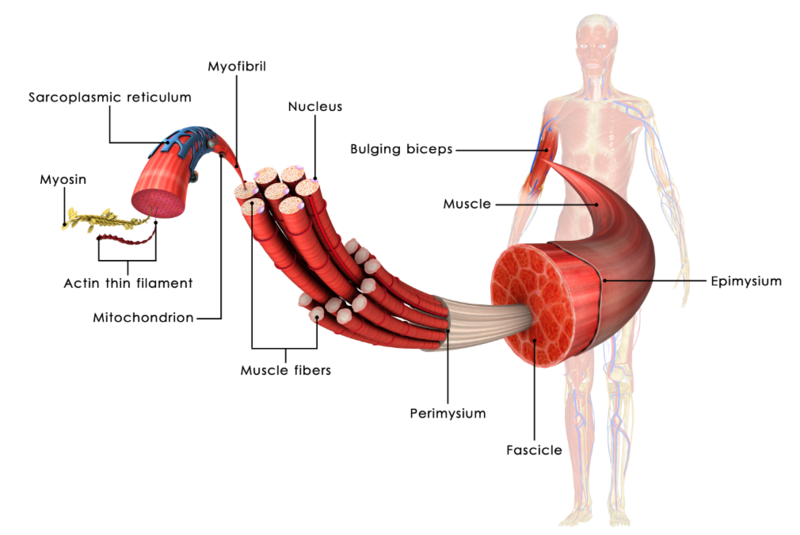 The muscle fiber is a long cylinder that contains bundles of smaller, long cylinders, called myofibrils. Myofibrils contain the myofilaments necessary for muscle contraction. A myofibril is composed of repeating segments called sarcomeres. The sarcomere is the basic unit of contraction in skeletal muscle. The striations occur due to the presence of the sarcomeres of the myofibrils. 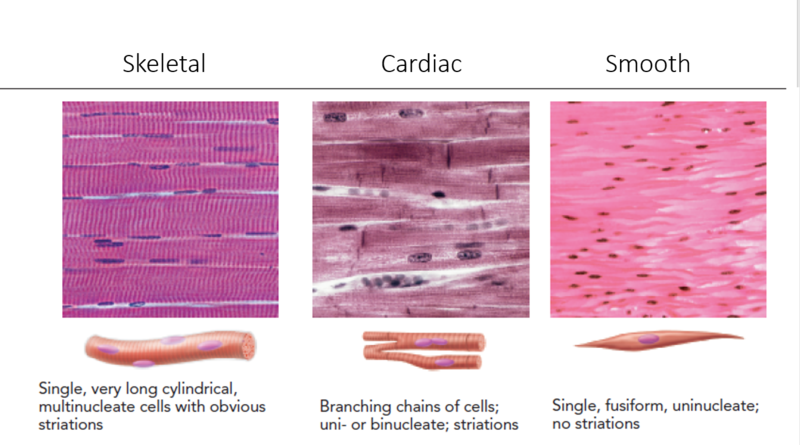 The striations of skeletal muscle fibers are due to the presence of repeated units called sarcomeres. The sarcomere is the functional unit of muscle contraction. The sarcomere contains filaments which slide past eachnother, contracting (shortening) the cell upon command from the nervous system. IMAGE Courtesy of : Blausen.com staff (2014). "Medical gallery of Blausen Medical 2014". ​Cardiac muscle tissue is made up of cells that are striated and have only one nucleus per cell. 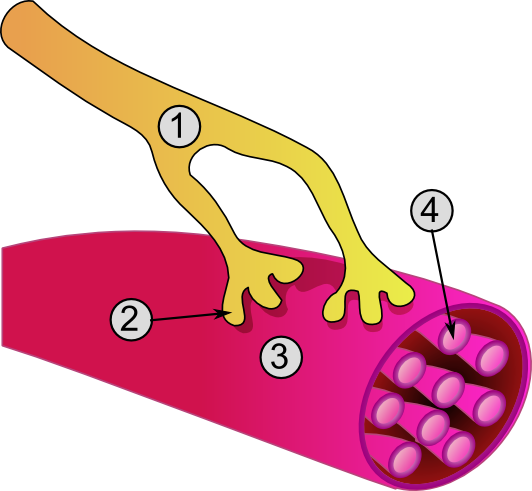 These cells create branched structures within the tissue that allows connections to be made between cells via gap junctions. Cardiac muscle contraction is under the control of the autonomic nervous system and, therefore, is involuntary. Image how your life would be if you had to remember to tell your heart to beat every second or so! Skeletal muscle tissue is the only type of muscle tissue that is under conscious (or voluntary) control via your somatic nervous system. Your brain sends signals down your spinal cord that connects with peripheral nerves to command the muscles to contract or to relax. Skeletal muscle is the type of muscle that most people envision when the word 'muscle' is used. These are the noticeable muscles that can give shape to our skin and act to move the various parts of your body at will. Skeletal muscle tissue makes up the muscles you have that are attached to the skeleton. They are made up of long striated tubular cells and multiple nuclei. The fibers are tightly packed together and are arranged in parallel and have several nuclei per muscle cell. Striated muscle tissue consists of myocytes that appear to be striped (transversely) with alternating dark and light bands of color. These striations are visible when the muscle tissue is viewed histologically (on a slide). Each elongated, cylindrical unit is a skeletal muscle cell, called a muscle fiber or myocyte. Skeletal muscle is consciously (voluntarily) controlled by the (somatic) nervous system. The point at which the motor neuron synapses with (comes into close proximity to) the muscle fiber is called the neuromuscular junction. 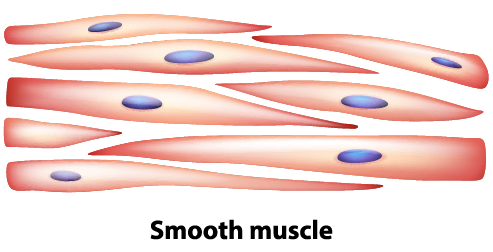 Most smooth muscle has a "single-unit" function, where either the whole muscle contracts or the whole muscle relaxes. Single unit smooth muscle is found in the linings of blood vessels (except large elastic arteries), the urinary tract, and the digestive tract. Smooth muscle can also function in a "multi-unit" fashion (see animation of the trachea), when there is a coordination of contraction and relaxation in the muscle tissue that acts to move substances from one area to another. Multi-unit smooth muscle is found in the trachea, the large elastic arteries, and the iris of the eye. Smooth muscle is able to stretch and contract repeatedly and upon relaxation will return to its resting shape. This ability is especially important for the digestive tract and the urinary bladder. It is Important to be Able to Distinguish Between the Origin and the Insertion Point of a Muscle. This information will tell us the function of the muscle. Remember that structure equals function! Skeletal muscles attach to at least 2 bones, and span one movable joint. The way that these muscles attach to the bones of your body, is through TENDONS. Muscles always PULL they never PUSH. When a muscle contracts, it pulls the bones it connects to closer to one another, by decreasing the angle of the movable joint that is spans. Typically, when we contract a muscle, one of the bones the muscle attaches to moves a lot, while the other bone(s) the muscle attaches to remains relatively "fixed" in space. The insertion is the attachment site that moves quite a bit during muscle contraction. Action NomenclatureMuscle contraction results in different types of movement. The particular movement is a direct result of the muscle attachment. Most of these movements are realized when we run. Each of these actions can be described in one of two ways. The first describes action in terms of the bone to which the muscle is attached or the appendage that is moved. For example, the biceps brachii performs flexion of the forearmas the forearm is moved. The second way to describe a muscle's action is based on the joint, or the articulation. For example, that same muscle, the biceps brachii, performs flexion at the elbow, in which the elbow is the joint. Muscle Functional RolesThe human body has over 500 muscles responsible for all types of movement. Each of these muscles has a name; for example, again, the biceps brachii and now the triceps brachii, responsible for both forearm flexion and forearm extension, respectively. When movement of a body part occurs, muscles work in groups rather than individually. Working together enhances a particular movement. During that particular movement, individual muscles will play different roles depending on their origin and insertion. These different roles can be described as agonists (or prime movers), antagonists, or synergists. Lesson SummaryIn summary, skeletal muscles are attached to bones on each end by tendons. The origin is the fixed attachment, while the insertion moves with contraction. The action, or particular movement of a muscle, can be described relative to the joint or the body part moved.